Your cars tyres are vital in bringing it to a safe and controlled stop. Fortunately, we offer a range of tyres at competitive prices. Your cars tyres are vital in bringing it to a safe and controlled stop. But even a tyre with the legal minimum tread depth of 1.6mm takes much longer to stop than a brand new one. And when road surfaces become more treacherous – for example, following rain or snow– the condition of your tyres is of even greater importance. Fortunately, we offer a range of tyres at competitive prices. Your tyres are the only point of contact between your car and the road, making regular maintenance checks and correct replacements a key consideration. Not only do tyres affect the acceleration, steering and stopping distance of your car, they are also key factors in improving fuel economy and reducing CO2 emissions. To help maintain your tyres, our Trained Technicians can check the tread depth, pressure, appearance and condition of your tyres free of charge. If your tyres need attention, you’ll be provided with advice on what is required. On the tyre sidewall there is information similar to the example below. We will try to explain the meaning of the individual numbers (highlighted in red) so you can identify the correct tyre for your vehicle. This number is the width of the tyre in millimeters. This is the most important number to describe a tyre’s contact patch. For example, a 215-width, 17-inch tyre may look great, but all things being equal, a 245-width, 15-inch tyre will out-corner it every time, because the contact patch is wider. This is the height of the sidewall from the rim to the tread, expressed as a percentage of the tread width. For example, if the tyre is 205 mm wide, and its aspect ratio is 50, then the sidewall is about 102.5 mm tall (50 percent of 205 mm). As you move up to larger wheels, or down to smaller ones, a corresponding change needs to happen in the sidewall height of the tyre in order for the rolling diameter of the wheel and tyre combination to be as close to stock as possible. This will ensure the accuracy of your speedometer and prevent unwanted alignment changes. The sidewall height affects the turn-in feel (the responsiveness you feel at the steering wheel) and the ride quality. Lower aspect ratio (shorter sidewall) provides better turn-in response than a higher aspect ratio, but at the expense of less break-away warning and a more jarring ride — in extreme cases, even exposing the wheels to potential bending and breaking damage from potholes and other surface irregularities. The tyre speed rating (i.e. W) is the maximum speed for which the tyre is rated. For example, the W rating identifies speeds up to 168 mph. Set to follow in the same style as the current energy efficiency labels, you will notice the familiar A -G grading system. ‘A’ being best and ‘G’ the poorest. As of November 2012, every tyre in the EU will come with a label just like this, making the comparison between different makes and models easier than ever. Below you will find the new EU Tyre Label explained. The energy lost when a tyre is moving is described as ‘rolling resistance’ and has a direct impact on fuel consumption and the environment. The tyres on a car can affect its fuel economy by up to 20%. The lower the rolling resistance, the tyre less energy is lost – reducing fuel consumption and CO2 emissions. In the EU Tyre Regulation label, rolling resistance is expressed in grades, ranging from A to G. A is the highest performance tyre in its category; G is currently the least performing. D is not going to be used as a grade, helping to draw a clear line between the top and bottom three grades – the good and the bad. Putting the scores into perspective, if fitting the worst scoring tyres in this category, you could end up using 6 litres more fuel than if you fitted ‘A’ rated tyres – so, potentially, ‘A’ rated tyres could save you enough in fuel bills to buy a new set of tyres! In the EU Tyre Regulation label, a tyre’s wet grip capacity is also expressed in grades from A to G, with A the highest wet grip performance. Like the fuel efficiency score, D is not going to be used as a grade. On top of this, there are no plans at the moment from the EU to use G either. The difference in braking distances between each grade is roughly 3m – the average length of 1 car. Making the difference between A and G 18m, 4 car lengths! This distance could be the difference between being involved in a road accident or not. 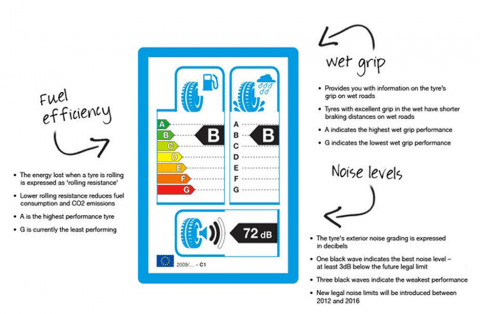 A tyre’s noise level grading is expressed in decibels, accompanied by one, two or three sound waves. One black wave indicates the best noise level performance. It means that the noise level of the tyre is at least 3dB below the future legal limit. Three black waves indicate the weakest performance in terms of tyre noise output. It represents a noise output level between the current maximum and the new lower limit. Winter tyres, or cold weather tyres as they are also known, will be the key to keeping Britain moving over the coming …months. This is thanks to their specialist compound and tread design which provides drivers with superior grip and control in wet and dry conditions once the temperature dips below 10°C. The cold weather conditions from two years ago look set to return with Forecasters predicting moderate to heavy snowfalls as early as October and November in parts of the UK. There is a huge lack of awareness in the UK about winter tyres. Either motorists are not aware they exist or they think that the tyre can only be used during times of heavy snow or ice. In fact, drivers will benefit from using winter tyres on slush, ice, frost and even wet roads. In fact any time the temperature dips below +10 degrees centigrade, you’re better off on winter tyres. What’s the difference between a winter and a summer tyre? The rubber compound of a winter tyre is very different to a summer tyre. It is designed specifically to work in temperatures below +10 degrees centigrade and has an improved tread pattern. Winter tyres are made from a specially developed compound with more natural rubber so they don’t harden when it’s cold, which means increased grip on the road and greater safety. In Europe it is a legal requirement to fit winter tyres when required. According to analysis by leading tyre manufacturers, up to 90% of vehicles on British roads do not have the correct pressure in their tyres – leading to increased fuel consumption and accelerated tyre wear. Alarmingly, it also increases the likelihood of serious road traffic accidents. 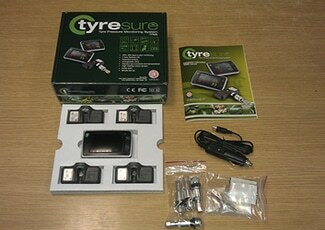 The Tyresure Tyre Pressure Monitoring System (TPMS) constantly monitors tyre pressures and temperatures, alerting the driver when tyre pressure or temperature are abnormal. The system features wireless technology and a visual display detailing individual tyre information with constant updates and preset upper and lower parameters. Accurate readings are displayed in green but the second that either the pressure or temperature moves outside the pre-set parameters, the readings display in red and an audible warning sounds. Having fitted the sensors to the wheels, the dash unit is plug-and-play by simply plugging into a cigarette lighter socket, or is easily hard wired if you prefer.